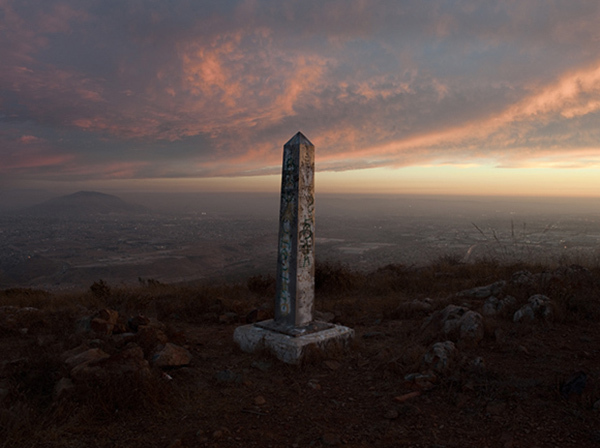 In 2007, I began photographing the monuments that mark the border between Mexico and the United States. My intent was to document each of the 276 obelisks installed by the International Boundary Commission following the Mexican/American War. The monuments locate the land-boundary as it extends west, from El Paso/Juarez to Tijuana/San Diego, through highly populated urban areas and some of the most remote expanses of Chihuahuan and Sonoran desert. The contemporary survey became reflective of a survey conducted by the photographer D.R. Payne between 1891 and 1895 under the auspices of the Boundary Commission. It also functions as a geographic cross-section of a border in the midst of change. Responses to immigration, narcotrafficking and the imperatives of a post-9/11 security climate prompted more change along the border in the early 2000's than had occurred since the boundary was established. Thus, the completed project exists as a typology, with the incongruous obelisks acting as witness to a shifting national identity as expressed through an altered physical terrain. 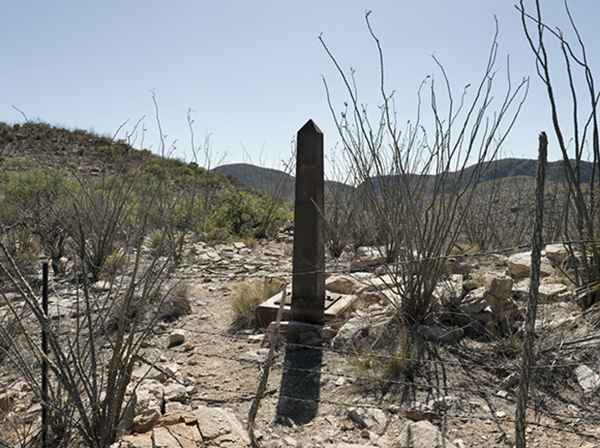 Photographing the monuments that mark the U.S./Mexico border has required driving and hiking through difficult desert terrain, camping out in remote areas, and interacting with whomever I meet along the way. While I've become good at anticipating the landscape, it's impossible to predict how encounters with people will unfold. 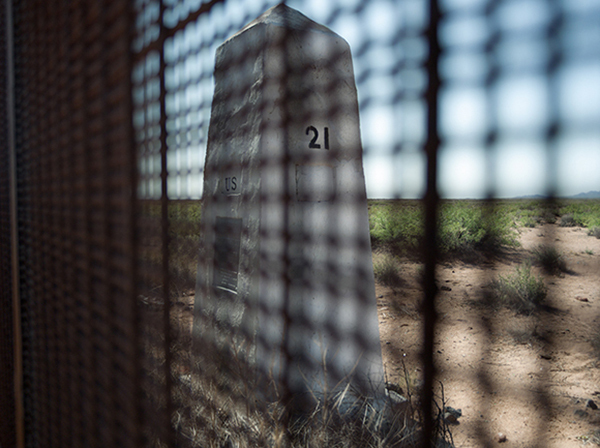 The border monuments describe an invisible cartographic line that traces the international boundary. They are, in fact, situated in both Mexico and the United States simultaneously. Getting to them can require permission if the monuments aren't located on open federal lands. Some are on limited access public land. Others are on private land; thus, one has to cross through private domains to reach those monuments. Border Monument No. 140 is located just west of the Sasabe Port of Entry at 31° 29.780' north latitude and 111° 35.206' west longitude. Accessing the monument required approval from the El Mirador Ranch. The "No Trespassing" signs that mark the road leading to the El Mirador ranch were weathered to the brink of illegibility and the gate to the property didn't look like it had been closed in years, but experience has taught me that I shouldn't assume anything. David Garcia was traveling with me as we pulled up in front of one of the half dozen buildings that make up El Mirador. He waited while I got out to find someone. I was immediately set upon by an assortment of dogs -- heelers and terriers all barking their heads off. I paused a few minutes by my truck figuring that the dogs would cause enough commotion to attract attention. That didn't happen so I approached the closest house, a small place with a rough looking porch, deteriorating paint, patchwork repairs and a wire fence surrounding the yard. After a few minutes a man came to the door, obviously irritated, and asked what I wanted. As he walked to his front gate, I explained that I was looking for the border monuments in the area and wanted permission to cross his property in order to access some of them. "Yeah there are some of those old monuments on my property," he said. "What do you want with them? Who do you work for?" I replied that I was making a survey of the monuments and added that I work as professor. "A survey -- what for?" he replied. "I'm photographing all of them to create a visual record of the land boundary with Mexico." "Didn't somebody already photograph those things?" "There was an extensive survey made when they were installed in the 1890s and they've been photographed by several people over the years but there hasn't really been a full documentation done in over 100 years." "What's the point - what are you trying to prove? Are you gonna tell me that the border is in the wrong place?" he retorted. "No, that's not my intent," I said. "Well what is it you want to do?" he interjected. "If you are here to prove that the wall is in the wrong place and that it has to be torn down then you can just get hell out of here. What side of the border is that wall on?" "The U. S. side," I answered. "Yeah, so we gave away a bunch of land to Mexico didn't we?" he inquired. "Not really," I replied, "the border hasn't moved -- the fence is on the U.S. side because it wasn't built under the terms of our treaty with Mexico. It was a unilateral act by the United States so it has to be on our side of the line." "So that's our land on the other side of the wall?" he interrupted. "If it's our land, can I climb over and walk around? I pay taxes, so that's my land and I should be able to walk around over there." I tried to respond. "Technically, yes, but..."
"OK then, if that's the case, those border monuments you want to photograph are on my property, right? If those monuments are on my property then I own them and I want to know about it." He paused and then said, "Who's paying for this project you're working on?" "I was awarded a grant." "A grant," he said with a dismissive laugh, "You can get a grant for that? Who cares about those monuments?" "People who care about history," I replied. "Nobody cares about those monuments," he interrupted. "I care about them, it's important to make a document at this moment since there's been so much change along the border over the last decade." "You're damn right there's been a lot of change. Before all the illegal immigration this was a nice, quiet place to live. I used to go to Mexico right over there in Sasabe for lunch or a drink. Now I can't do that. There are Border Patrol Agents all over the place tearing up the roads and driving too fast. People like you are always coming onto my land. All because of the border. Who gave you a grant to come out here anyway?" "The Guggenheim Foundation in New York," I answered. "Guggenheim? So that's a big deal, they pay history professors to drive around on the border?" I said, "I'm an artist, not a historian," knowing that I was opening up a totally new line for interrogation. "AN ARTIST! YOU'RE AN ARTIST? That wall is like a big piece of art. What's his name? Christo! It's like a Christo. Now you're talking. Get your umbrellas and lets make a splash in New York. How much did they give you to make pictures of those monuments?" "You're kidding, my ex-wife is an artist. She'd love to know that. If she'd ever gotten a grant like that I'd probably still be with her. So where are these monuments that you want to get to exactly?" I explained the topography as I understood it from maps and the other information I had and gave my best estimate of where I thought the monuments were located. "Yeah there's one just over that ridge to the south of us," he replied. "I like you so you can cross my land. It's late and it'll be a long hike. Do you have water?" "Drive up the dirt road, park near the bulldozer and walk up past the washout. There's a stone house at the top of the ridge. You should be able to see the monument from there. It's a big white one. Can't miss it. I'm not sure about the other one so you better check your facts. If you need to, you can camp up on the flats near the bulldozer because it's getting late and I don't think you can make it today. I have to drink a half gallon of water for every half mile I hike out there in this heat." David Garcia and I reached the monument after hiking the ridge line for about an hour. It wasn't visible from the stone house. One of the six-foot tall cast iron obelisks, deep brown with rust. Number 140. By the time I had finished photographing it was close to 5:00pm. The trails we had hiked to reach the monument had lots of fresh foot sign and many of the water bottles we saw were new with moisture still clinging to the inside. We could see monument 141 about two miles west of us on a south facing ridge but decided that we wouldn't have enough light to get to there, photograph and make it back to my truck before dark. With all the evidence of recent activity it seemed better to come back on another day. On our way out, I stopped at the house to say thank you. The greeting was much more relaxed the second time around. "Did you find them?" he asked. "Yes," I said, "but we only made it to 140. It didn't seem like a good idea to be out there after dark." I walked up to the fence and said, "I didn't get your name before." "Roy," he said while extending a hand. "Do you mind if I come back later this month to photograph the other monument?" "That fine, you're welcome to it." "Thanks very much for helping me," I said. As I was walking back to my truck Roy called out, "I want one of those pictures and when you come back don't forget those umbrellas." David Taylor's photographs have been exhibited and published widely. His examination of the U.S. Mexico border was supported by a 2008 fellowship from the John Simon Guggenheim Memorial Foundation. Taylor's monograph "Working the Line" was published by Radius Books in 2010 and has received numerous "best book" and design excellence awards. He resides in Tucson, Arizona and teaches in the University of Arizona School of Art.